From our perch 1,000 feet above the San Juan River at Goosenecks State Park, we awoke to another beautiful spring morning. The winds during the night were mild, providing us with a wonderful night’s sleep. After enjoying our coffee with a view, we decided to explore the surrounding area. 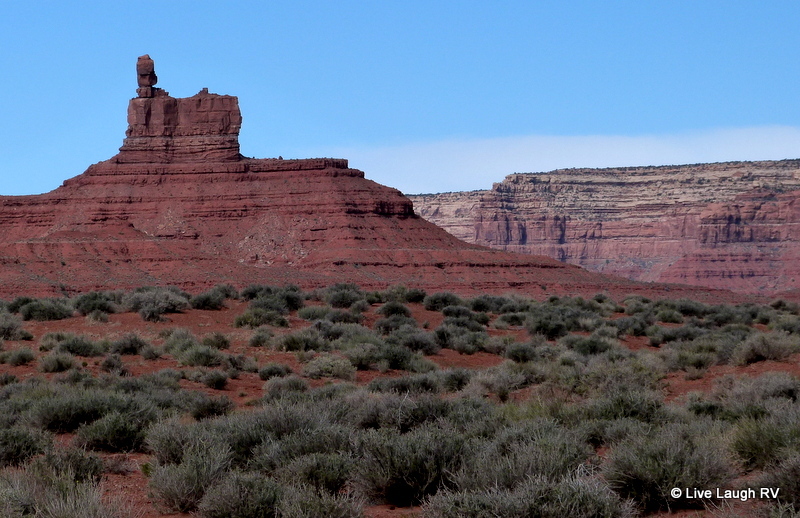 The day’s destination was Valley of the Gods. This 17 mile gravel scenic drive took us through some of southern Utah’s stunning sandstone red rock formations similar to Monument Valley. 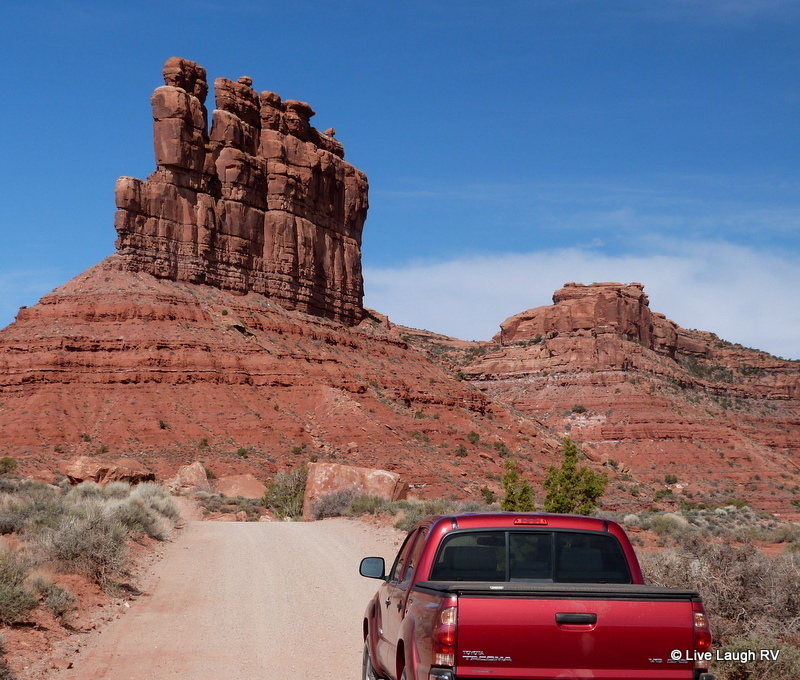 We accessed Valley of the Gods on the valley’s eastern end which starts about nine miles north of the town of Mexican Hat along U.S. 163. This gravel road is relatively well maintained and usually passable by normal vehicles in good dry weather. As we turned off of U.S. 163, the gravel road immediately dipped and we crossed Lime Creek, a seasonal wash. Since we’d received some rain a few days earlier, there was indeed a small stream of water we needed to travel through…..piece of cake for my little truck or any other high clearance vehicle. After crossing the stream, the road climbed up slightly and we were greeted with a stunning view as the vast valley opened before us. 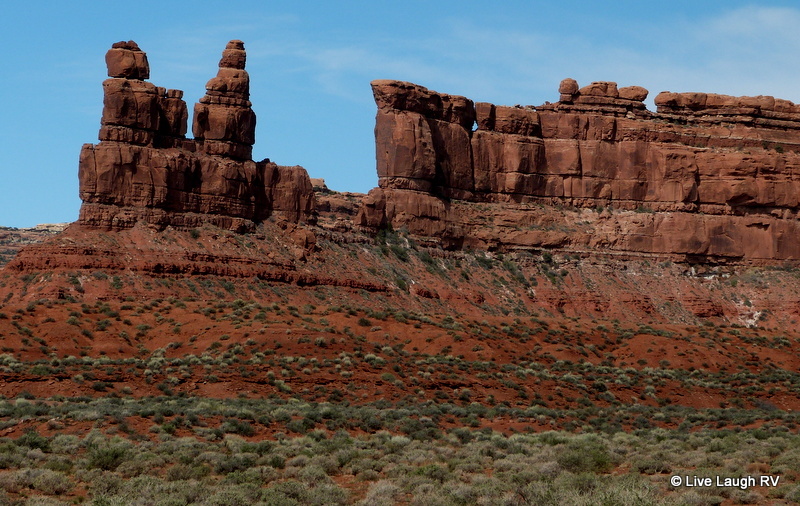 There were tall sandstone rock formations as far as the eye could see. 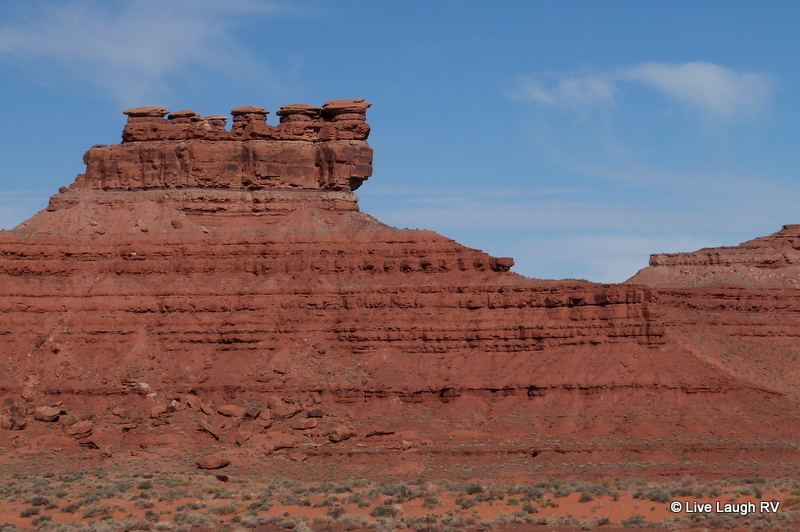 These red mesas, buttes, cliffs, pinnacles, and monoliths form unique shapes. Shapes that one can’t help but name because of the unique characters they seem to form. The locals have name a few. 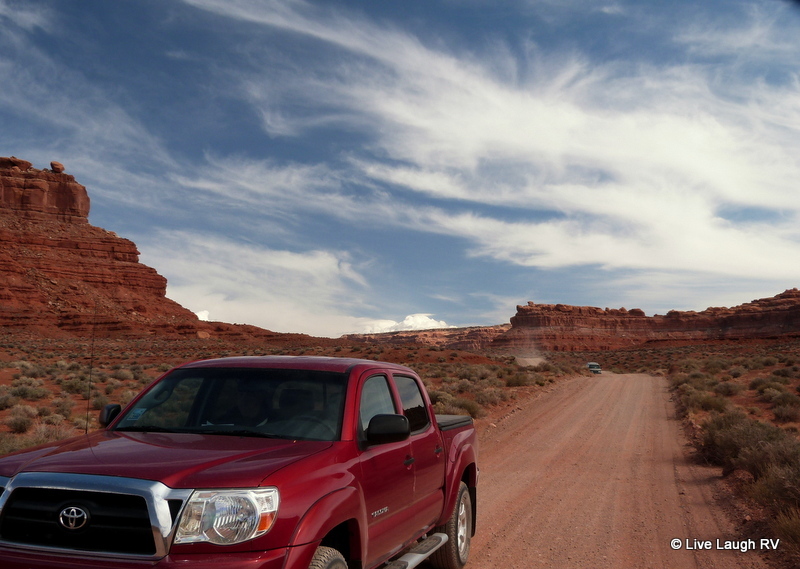 Valley of the Gods is managed by BLM (Bureau of Land Management) and as such, dispersed camping is allowed. 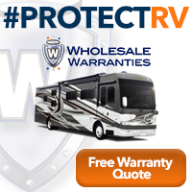 Many of the campsites we came across would comfortably fit just about any size RV. Definitely a boondocking paradise. 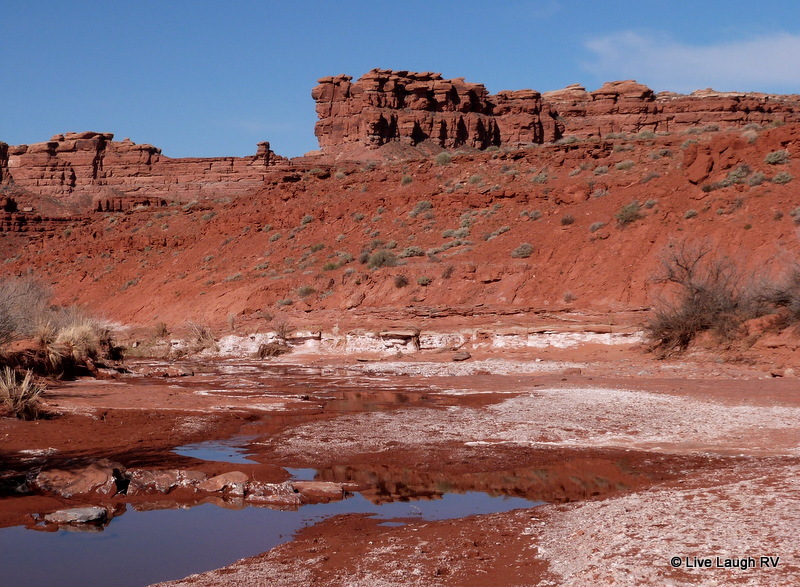 The major obstacle in accessing this beautiful valley with a RV is that first big dip in the road at the entrance to the valley and crossing the wash that could be wet and muddy . 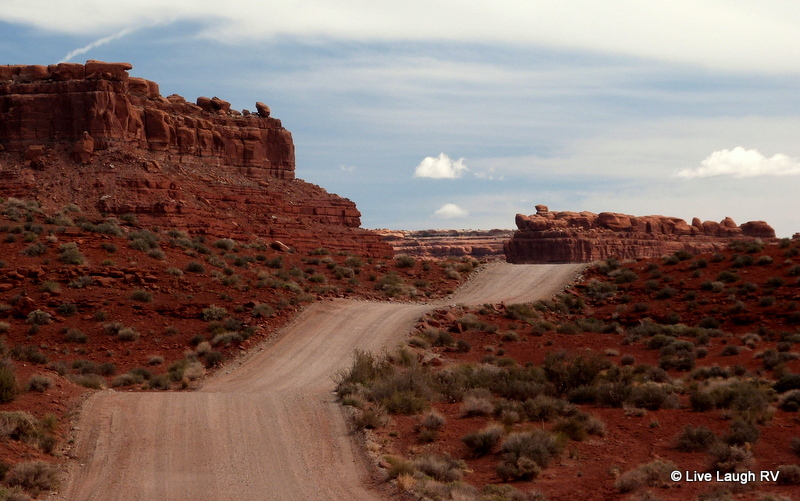 Entering from the west would not be an option because the road gets more difficult with dips, turns, switchbacks, and narrows the closer one gets to Utah route 261.
a trailer boondocking. What a great campsite. Yep, I could call this home! Great fire ring. Although all the info says no fires are allowed and yet almost all the campsites seem to have a rock fire ring. As the road winds through the valley, Al and I found ourselves stopping numerous times to take in the view. 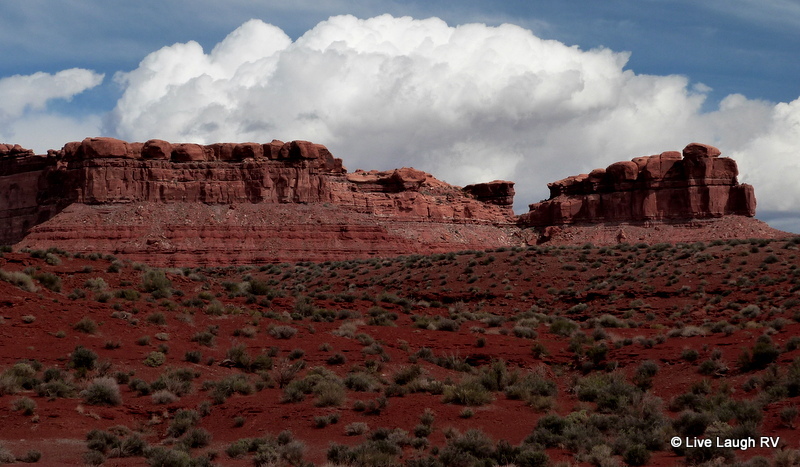 We checked out various boondocking campsites and admired the red rock formations and scenery. This is definitely a mini Monument Valley and what’s even better is the lack of restrictions. Monument Valley is on Navajo land and thus regulated by the Navajo people with strict rules. 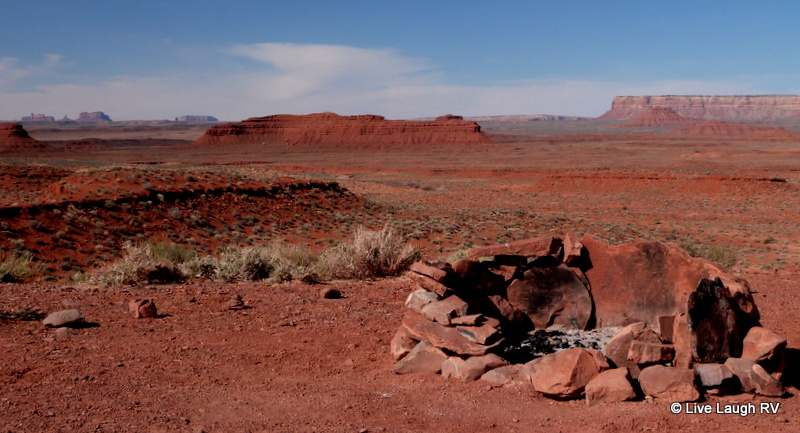 Valley of the Gods is located on BLM land and offers us all the freedom to camp, hike, and explore to our hearts content with a few simple regulations. 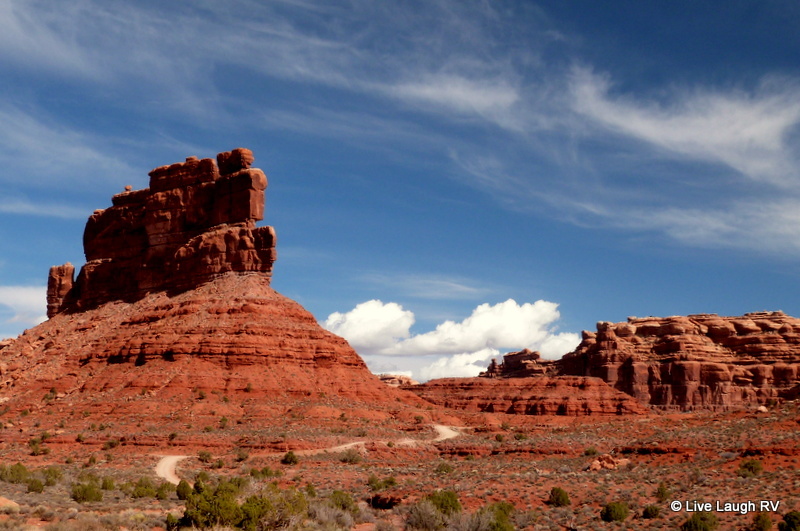 Yes, Valley of the Gods is truly a hidden gem….. one we’re very glad we discovered. 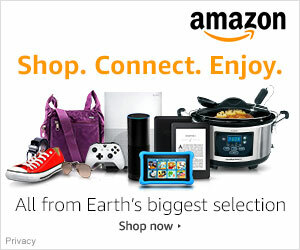 Wow, what a great place! Now, can we get prepared to boondock long enough with our residential fridge? May need to have the solar panels before we try this one. Great article! Looking at your pictures I understand the Mother Nature is the best Artist. Thank you for lovely excursions through the West. Thank you for invitation. Utah is definitely looking magic an promising. Those skies. . .those magical skies. . . So glad you made it there, by the time we get there again we should be set up for some boondocking we’ll have to consider Valley of the Gods. Am green with envy. Next fall. Awesome pic’s. We will definitely be boon docking. Thanks for the info. We’ve been there in a car years ago and I hadn’t thought about camping there, but that would be great fun – it’s so pretty there. Coffee or cocktails sitting outside the RV watching the sunrise or sunset……pretty awesome, don’t ya think! We did a side trip to Valley of the Gods from Monument Valley (http://jaspasjourney.wordpress.com/2012/11/10/snowstorms-dust-storms-monument-valley-and-more-snow-southwest-usa-2012-days-10-11/) to find a geocache a couple of years ago. It was breathtaking! Thank you for even more awesome scenery! It is very much like Monument Valley, and since I’m a tent camper, I’d love to camp there! We come across so many awesome places to tent camp. A couple of summers ago, we even got out the tent and left the RV behind. Some places just need to be experienced without the creature comforts of an RV. We loved that place. We had a ton of rain when we were there also. Couldn’t touch the beauty of the place though. Keep enjoying the good life. Obviously we really enjoyed our time here and hope to return next season. I did review your post on the area as well. I wonder how muddy the roads get after the rains? I here the roads look even prettier. Hope you’re enjoying spring in Ohio. One of favorite places in Utah. I love how they named many of the formations. We also named some of the others. What an absolutely fabulous place and your photos were award winning…Make me want to get back in that Hiker…But at least you don’t mind if Den and I travel along with you and Al…Hey, lets get a 6 pack and another road trip soon! Such whimsical names for the rock formations! I especially like the Lady in the Bathtub. That was my favorite as well. Kind of a fun little place. Breathtaking and stunning, what more can I say! But looks like we can’t boon docked there with our size. Ingrid your landscapes shots are just fabulous! Thanks ML. No, you’re 40′ Betsy would get stuck in the dip. The campsites themselves wouldn’t be a problem though. 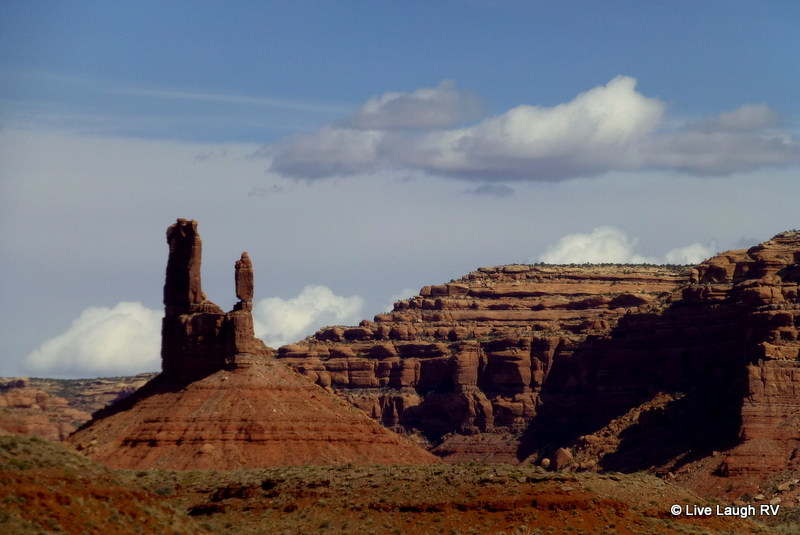 Just stay at Goosenecks SP and visit Valley of the Gods and you’re good to go 🙂 This is country I highly recommend seeing first hand…. photos do not do it justice. 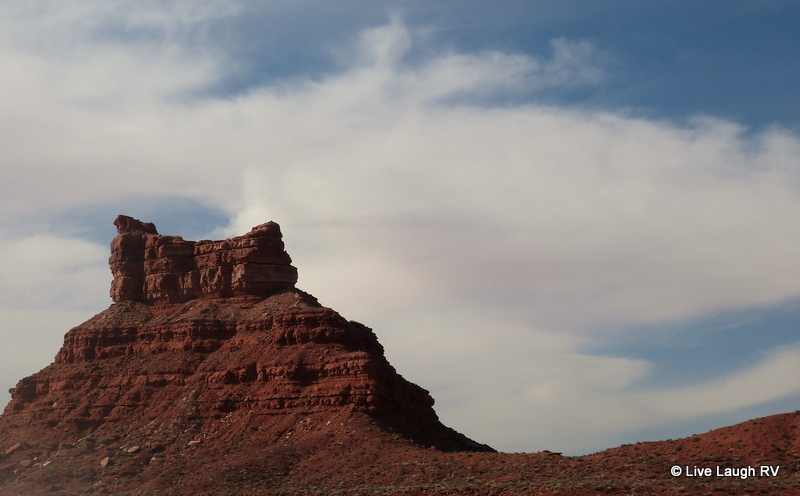 I can see why they call it Valley of the Gods…it truly is breathtaking. Boondocking for a few days sounds perfect for nice cool and dry weather. Enjoying all the pictures…a lot! Thanks. I think it would be very enjoyable to be camped in Valley of the Gods to savor the sunrises and sunsets along with a star filled sky. But you are so right – cool and dry weather a must. I haven’t visited Valley of the Gods. Your beautiful photos reminded me the Arch National Park. It’s enough to make us downsize! So so beautiful there! I love that you knew the names of those rocks. Just think of all the lovely spots you’ll fit with a smaller home 🙂 I found a map on line with all the rocks named and planned to use it on our tour, but then left it back at the RV, dah! So I didn’t get photos of all the named rocks like I had planned. Ingrid, Really fab photos! And thanks for the map. Including the map in your blog is a real winner. You welcome…..glad you enjoyed. 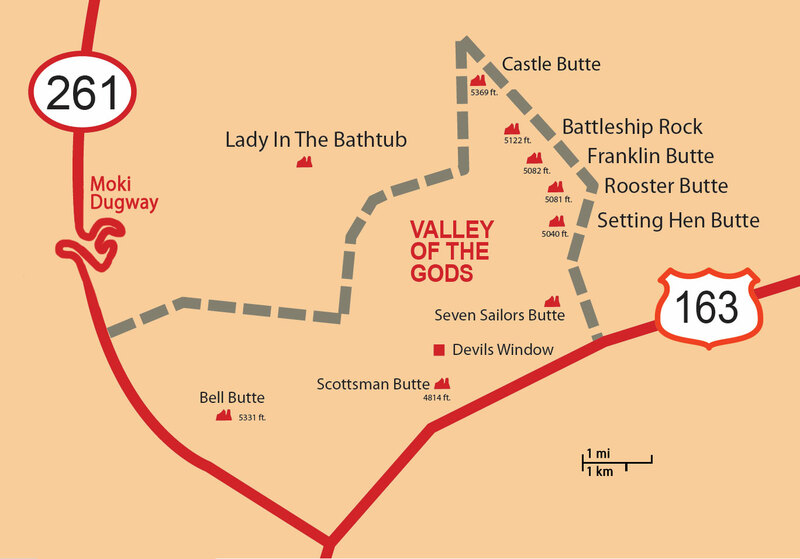 I’d read about Valley of Gods from several other bloggers but had to dig to find exactly where it was located so when I found this map I just had to share. One of our fav spots from our trip last year in Utah! I so width we could’ve boondocked there. Nice shots. If only the weather would stay this way and not venture into that 100 + territory, I’d be one happy camper. 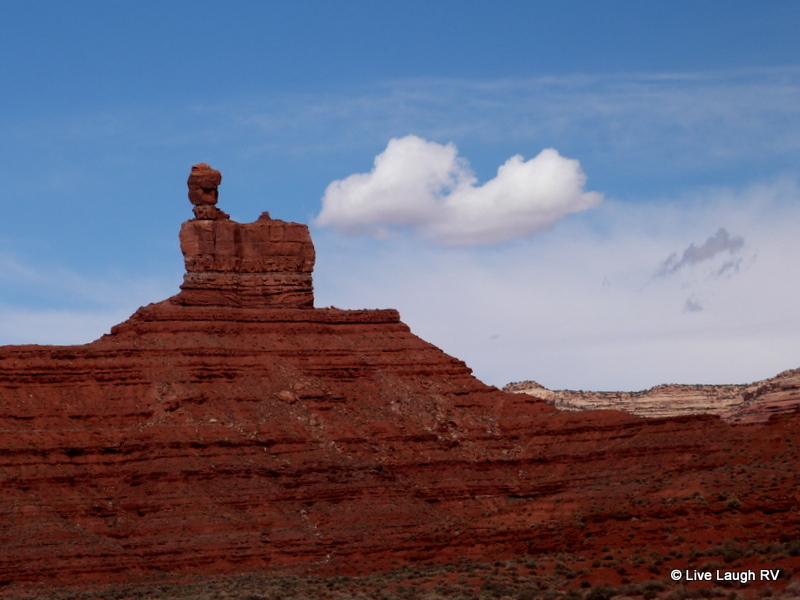 Utah is an incredible state that needs to be explored slowly…..so many hidden gems. 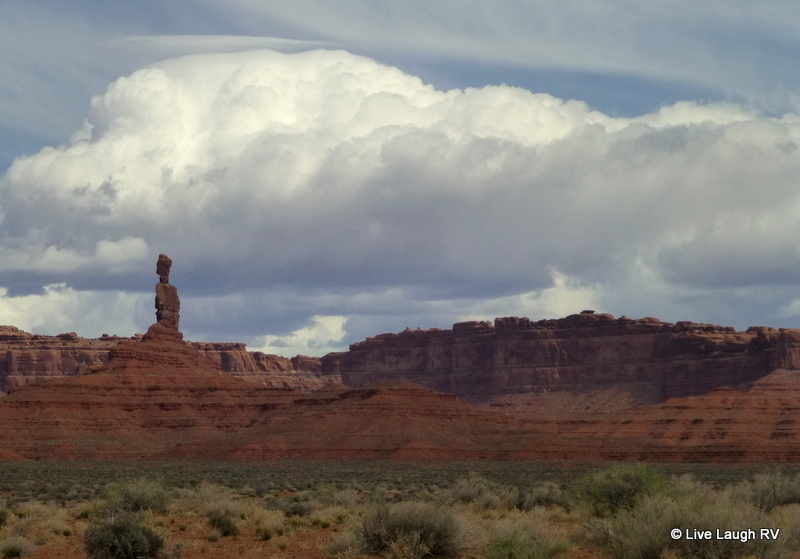 When we looked at your map we knew we had been so close on previous trips- Mexican hat etc. we are planning to get there in July- and I know, it will be hot, but I can DO hot. What I can’t do is months of rain in guernsey! Ingrid such fabulous shots of an amazing spot. Hope you had a good Easter. Well, you’re doing far better than me 😉 Maybe I should just finish off all those Reese’s eggs and then they’re gone. Like my logic? Like it? I live it. Wow. What incredible scenery! Thank you for sharing your adventures. Welcome back to the blogosphere. 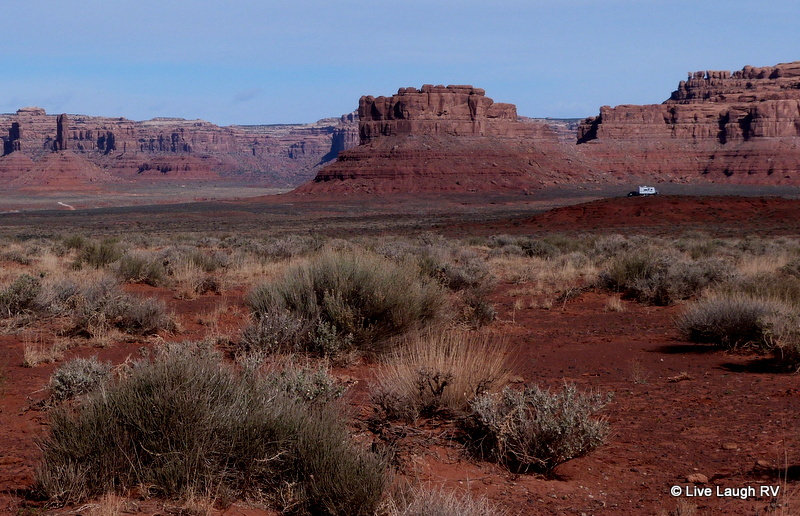 You would love hiking and exploring Moab (2 hours north of Valley of the Gods – posts forthcoming). It’s a playground for adults filled with outdoor adventures. Thanks for sharing. This looks like a great boon docking area. Love the lady in a bathtub!